Yesterday I attended the Queens Day (Koninginnedag) in Amsterdam, a festive day when up to a million people flock to the city to celebrate. 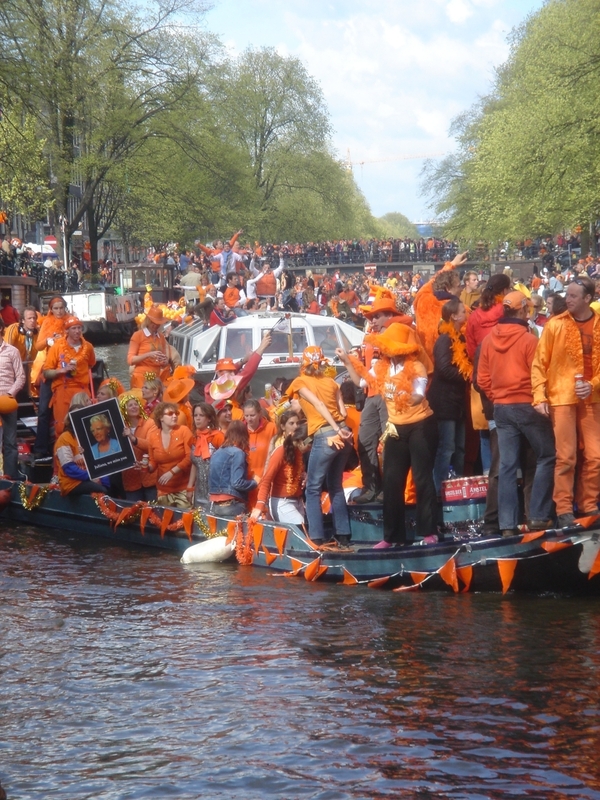 They all sport clothes, hats, garlands, feather boas and socks coloured bright orange, the colour associated with the royal family of the Netherlands. They do it to honour Queen Beatrix who celebrates her official birthday on the birthday of the former Queen Juliana. 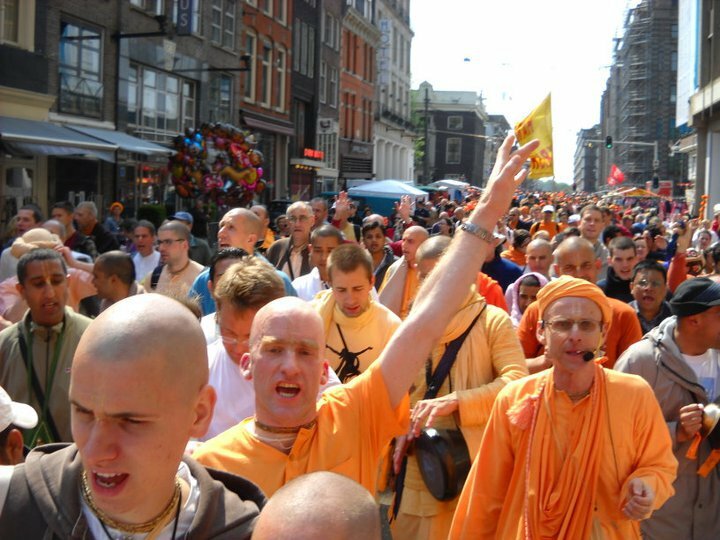 So what do the devotees of Krishna do at a festival where everyone dresses in orange? Well for a start they already feel quite at home with the colour choice. The Hare Krishna saffron is really a strong orange so when they walk around in the Queens Day festivities they are like the proverbial green parrot in a green tree. 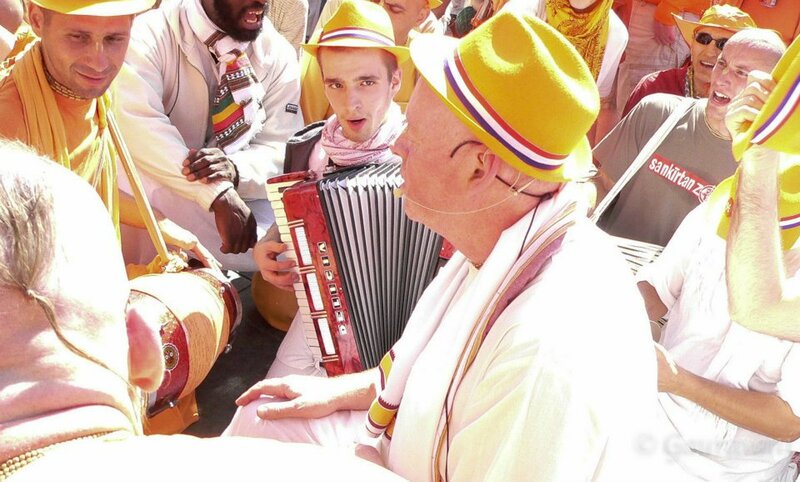 And to join in with their fellow orange celebrants the devotees – around 300 of them – sing and dance in kirtan. In classical India the colour orange is normally associated with self-restraint and adherence to moral values. Despite the piety of the original William of Orange, the modern-day orange revellers had more transitory forms of happiness on their minds. Nevertheless, the effect of kirtan on the revellers was quite hypnotic. As we wove our way in the sunshine through the crowds along the streets and canals (and Amsterdam has 140 kms of canal) the crowds moved in around us, pulled in by the magnetic force of the sound of drums and cymbals, the raised voices happily singing, the dancing, the spontaneous party mood – and the strong colour of orange. Irresistible. This year I was lucky to be there and experience it at first hand. I’d been kindly invited by Kadamba Kanana Swami who has organised the event for the past 16 years. Although I was clad in my customary pallid white I was given an orange hat which simultaneously served to protect me from the blazing sun and gave me a touch of the festive colour.